WORCESTER, MA (October 5, 2015) – Steven Gonzales has many credits to his name: He is a veteran of the United States Navy, having served from 1989 to 1992. He is working towards a Manufacturing Tech Associate’s Degree at Quinisgamond Community College in Worcester. He is the Treasurer of the Veterans Club at Quinisgamond Community College. And as of today, he is the owner of his own car, thanks to the generosity of area businesses. 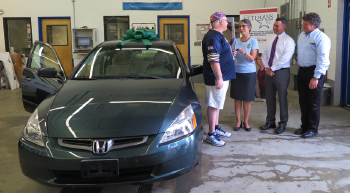 Gonzales was presented with a 2004 Honda Accord at CARSTAR Thomas Waldron Auto Body on Grafton Street in Worcester this week as part of the “Recycled Rides” Program, an effort of the National Auto Body Council to provide refurbished vehicles to individuals in need. The vehicle, donated by Esurance, was refurbished by CARSTAR Thomas Waldron Auto Body. Gonzales was selected to receive the vehicle by Veterans Inc., a 501(c)3 non-profit serving veterans in need and their families. "Today's Recycled Rides event again demonstrated that the recipient is not the only one affected by this program,” said Linda Sulkala, Recycled Rides Program Manager for the National Auto Body Council. “This is a life-changing experience for everyone who participates or contributes to the vehicle donation. We are very proud that through our Recycled Rides program, members of the National Auto Body Council demonstrate the professionalism and integrity of our collision repair industry by providing many struggling families with the keys they need to help improve their quality of life. It is especially gratifying to have the opportunity to give back to a veteran as we did today." The National Auto Body Council’s Recycled Rides is a nationwide community service program in which the collision repair community collaborates with other industry partners to repair and donate a vehicle to families and service organizations in need. Insurance, rental car and salvage companies donate slightly damaged vehicles, parts and materials are donated by suppliers, and auto body repairers donate resources to restore the vehicles. Since its inception in 2007, nearly 1,000 refurbished vehicles have been provided to qualified individuals, families and organizations. “We were glad participate in today’s program. Many people put a great deal of time and effort into making this happen, and I’m just glad that we were able to be a part of it and make a positive change in a veteran’s life,” said Bob Waldron, owner of Thomas Waldron Auto Body CARSTAR. Veterans Inc. is New England’s leading provider of support services to veterans and their families. A 501(c)(3) non-profit, the organization’s single-minded mission is to be there for our veterans in their time of need. Incorporated in 1990, Veterans Inc. has helped more than 60,000 veterans in need and today operates offices and programs in all six New England states. The support services include housing programs, counseling, employment & training, family programs, benefits counseling and advocacy, transportation, temporary financial assistance, health and wellness, food services, and women & childcare services. Earlier this year, the agency was honored with the National Coalition for Homeless Veterans 2015 “Outstanding Member Award” in Washington. Mr. Gonzales receiving the key to his 2004 Honda Accord. LEFT TO RIGHT: Steven Gonzales, U.S. Navy Veteran; Linda Sulkala of the National Auto Body Council; John Person of Veterans Inc.; and Bob Waldron of CARSTAR Thomas Waldron Auto Body.